Rename Expert provides a variety of powerful features for the mass renaming of folders. 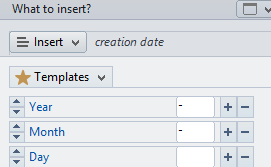 For example, folders can be renamed based on their properties (such as creation or modification date or the name of the parent folder). Furthermore, the program allows you to integrate a particular part of the name of included files or folders contained into the folder name. Folders can also be named by using a list or a CSV file. By using the filter, folders with certain criteria can be excluded from the processing. A variety of folder attributes can be used as criteria. The program supports recursive renaming of folders (i.e., including subfolders and files contained) with full network support. By using the command line version of Rename Expert, it is possible to automate the renaming of folders.